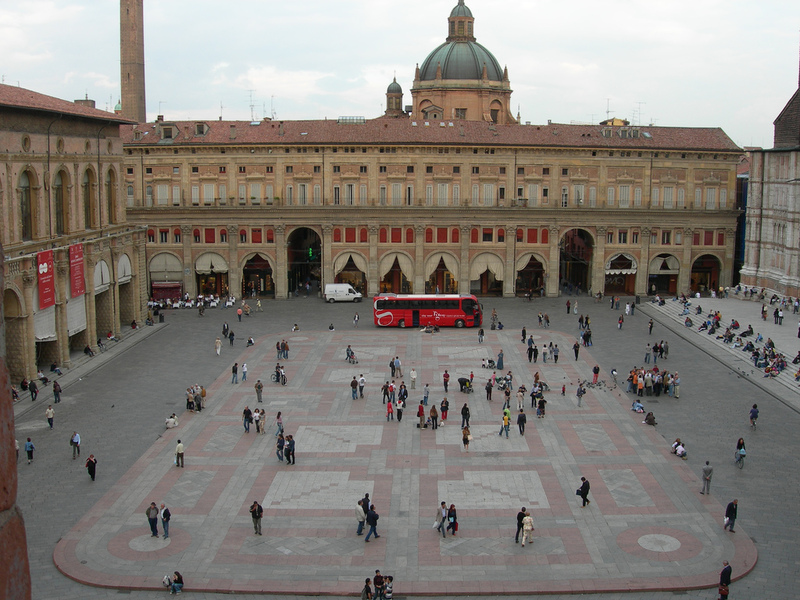 Piazza Maggiore is a square in Bologna, Italy. It was created in its present appearance during the 15th century and forms the heart of the city. 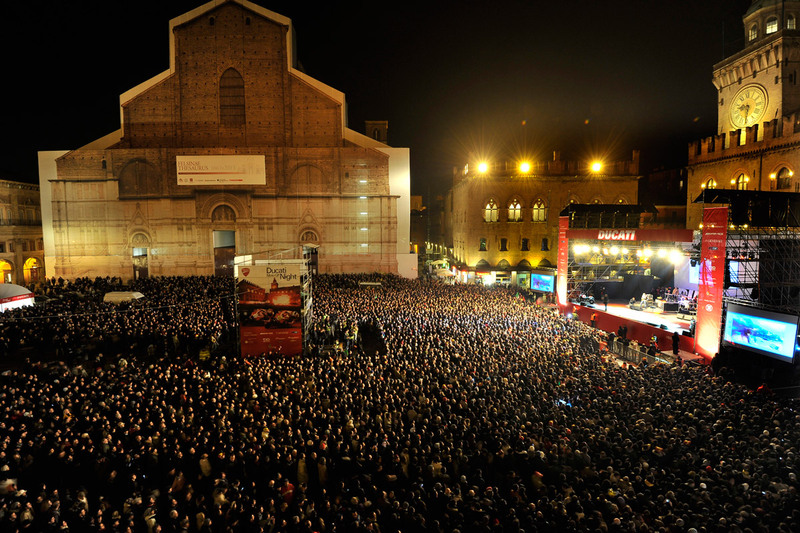 As a meeting point, a location for markets and, more recently, concerts, the piazza has served generations of Italians. 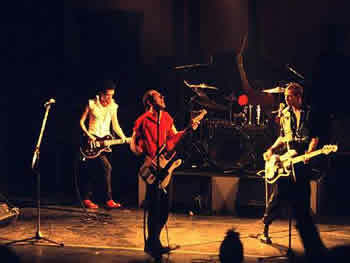 One such concert took place on June 1st, 1980….The Clash played to over 30,000 fans in one of their more memorable and yet out-of-the-ordinary performances. 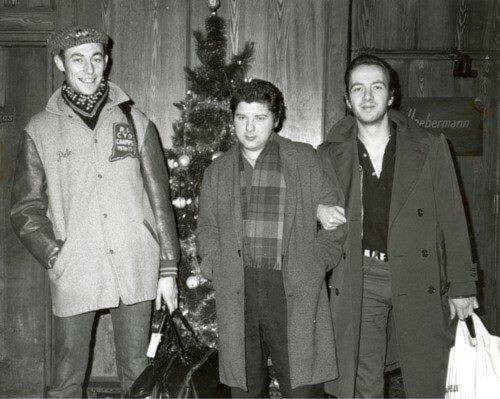 Last week (December 14th), a tribute benefit show in memory of Joe Strummer was held at the Via della Cooperazione, in Bologna. 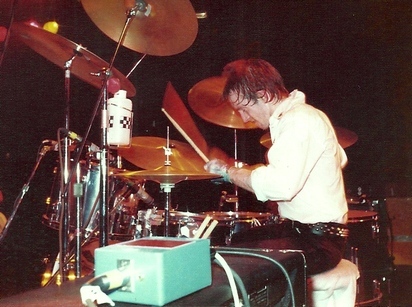 Johnny Green, the band’s ‘iconic, hell-raising road-manager’ was the host along with band confidante and long-time best friend Robin Banks, to liven the proceedings. 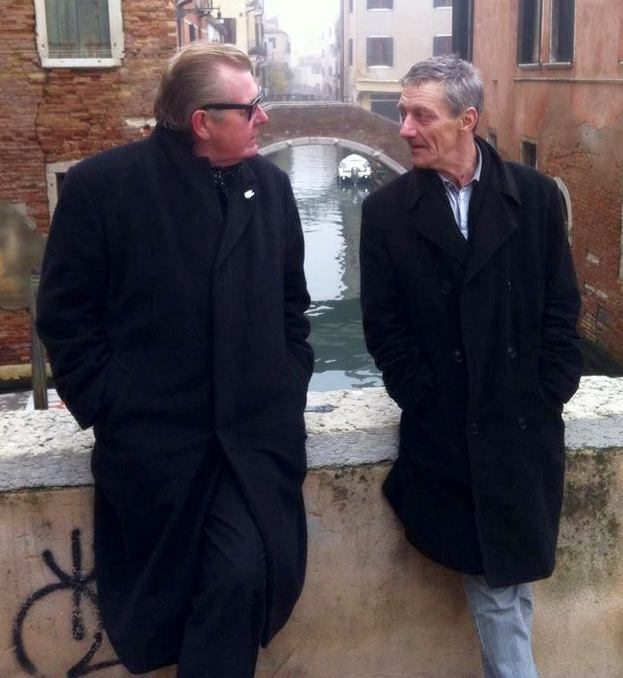 Johnny and Robin relax in Italy. Back in some of the darkest days of the band’s existence, Johnny and I served as the sole road crew as we struggled to keep the band afloat with little money or support from the record company. Wold you buy a car from these two? 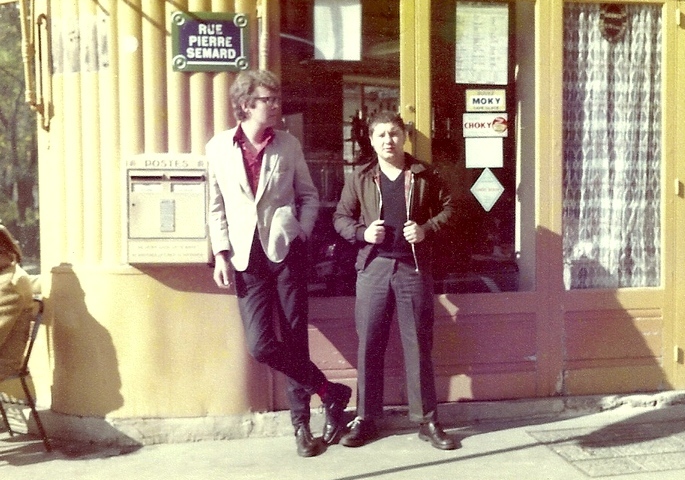 Johnny and The Baker in 1978. “….First let me say that Topper’s lateness had nothing to do with drugs (as has been suggested). The band’s security man (Ray Jordan) who was driving him, simply lost his way (years before GPS or cell phones), so no one had any idea where he was or what had happened to him. Some of the Italian fans. “Yes you can!” everyone in the dressing-room said, “You’ve done it before – it’ll be fine.” Joe was firmly sincere and convincing in his efforts to persuade me. Paul thought it was hilarious. I wasn’t convinced by their bravado and for the next fifteen minutes I tried to prepare myself physically and mentally. How had I not seen this coming? I cursed myself and had a quiet mental breakdown. Still no word from Topper as Ray Jordan was whipping their hired car back-and-forth across the Bologna countryside, hopelessly lost. Calls from the organizers and show officials came in – they HAD to go on! Finally, just minutes before the final deadline, George Butler from Whirlwind (supporting), came into the dressing-room and offered his services. It was a stark choice between someone who knew the numbers in his sleep, but wasn’t a drummer, or a drummer who didn’t know any of the songs. After some discussion, the band decided on George and he was pressed into service – I thanked the heavens! The set was hastily rearranged to include ‘Brand New Cadillac’ and ‘Jimmy Jazz’ at the beginning for their simplicity. George went on, staying very low-key and kept a steady beat through the first four or five numbers with me at the side of the riser, trying to give him visual clues to the numbers. It was a dull, if passable performance, with visibly low-energy from the crowd and the band. Suddenly, Topper appeared at the side of the stage. He dashed onto the stage, grabbed a pair of drumsticks and the band crashed into ‘London Calling.’ The show immediately kicked into high gear with the band feeding off of Topper’s energy and power. The crowd responded in kind – they went mental! Pent up frustrations were finally released for both audience and band alike and the hairs stood up on the back of my neck. It was one of the most intensely enthralling and ultimately rewarding shows the band ever played and they were truly thankful afterwards to the Bolognese fans for their patience and loyalty. 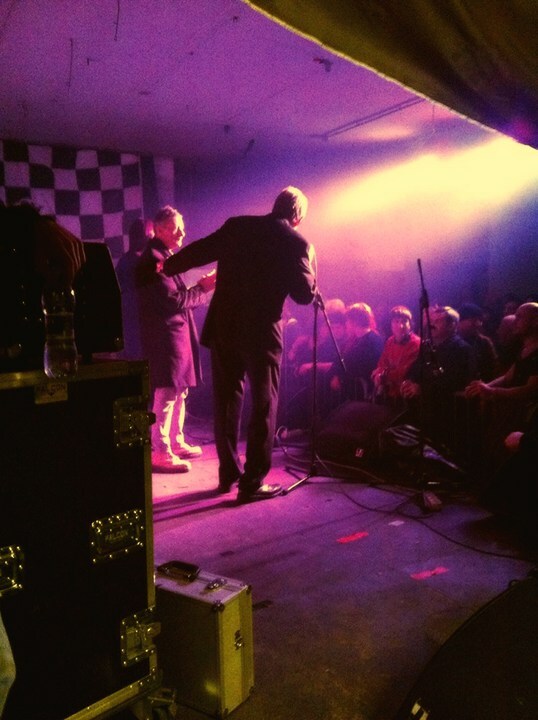 Robin Banks and Johnny Green entertaining the audience at the tribute show (photo courtesy of Steve Kirk). 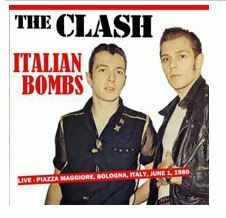 This entry was posted in Uncategorized and tagged Bologna, Brand New Cadillac, Clash, Jail Guitar Doors, Joe Strummer, Johnny Green, Piazza Maggiore, Robin Banks, The Baker, Topper Headon on December 19, 2013 by thebaker77. Baker aka punks Samuel peeps is an amazing writer, every time he writes he entertains, keep it up my son . I enjoy reading your stuff. Always better from somebody that was actually there. How did you get to be a roady for them and how long did you do it for? I arrived at ‘Rehearsal Rehearsals’ as a school-friend of the ‘Subway Sect’ in early August 1976. I quickly became roadie for both bands. 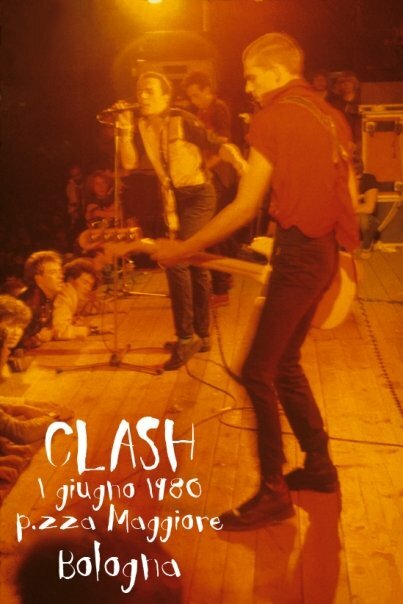 I worked for The Clash until September 1983 when Mick was fired. I set-up at practically every show, every rehearsal and every recording session plus they were a bloody good bunch of blokes to be around. We had many scrapes and near-misses – I still regard them, some of the other roadcrew and the people involved as life-long friends. Thanks for the sentiments Sarah. Thanks for that Carlos….let me know what you want to know and I’ll tell it if it’s in my power. I’d buy a car from either of you. You know what I’d do. Happy Holidays, Baker. Thanks for taking us through another chapter of Clash lore. Moments of leisure have been thin on my end, but I’m glad I got here this evening (via Tim’s share on the fb page). 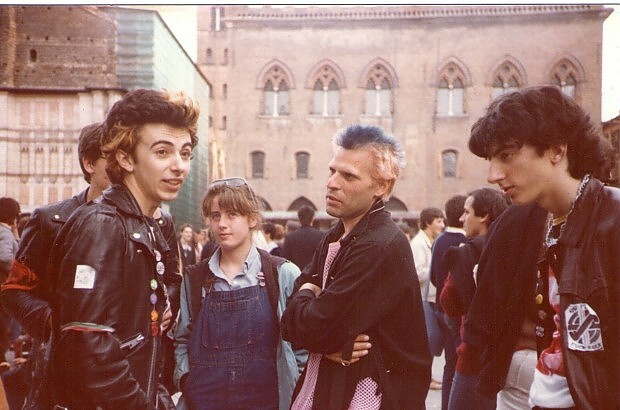 I had the good fortune to accompany Johnny and Robin along with Vision of a homeland (The History of Joe Strummer and the Mescaleros) author Ant Davie to the 10th Italian tribute to Joe Strummer last weekend, apparently this could be the last one so to have Johnny and Robin as guests was extra special. We managed to squeeze a day and night in Venice for a spot of sightseeing although when we arrived on the Friday evening the fog was so bad we may have been in Paris or Scunthorpe it was hard to see more than a few feet ahead….anyhow the next day was quite clear so we took in the sights, got lost a few times along the small alleys that make up Venice and generally had a good old stroll around and you couldn’t get better company really. We arrived at the venue Labotorio Crash around 8.30 and the event was in full swing , a band were on playing Clash covers Complete Control etc, we were shown through the already busy hall into a backstage area where they had purloined a kettle and tea bags and milk for a nice cuppa, and fed us on pasta…by now the word was out that the chaps were in the building and a steady stream of people had come to say hello, get a picture, get a copy of a book signed or just shoot the breeze, luckily we had our translator Silvia to help out at times when not everyone spoke English and our Italian was minimal at best..
Johnny and Robin got up on stage to chat and Johnny told the story of the Bologna gig and Topper going missing , the crowd loved it..
After that there were more some very good bands , some played Clash numbers others played their own songs I have to say band of the night for me were Rasspresaglia who blew me away with their short 4 song set of tuneful Punk/Oi, most of, the by now, big crowd knew the words and were singing along with the band I also enjoyed The Stab and Ratoblanco, a top top night put on by people with the right attitude , loads of bands, have a drink and have a good time in Joe’s memory ..oh and raise a bit of cash for his charity….hopefully they will reconsider and put it on again next year…SK. Fantastic review of the Tribute show Steve. Thanks for sharing your colourful and vivid memories with everyone. By ‘passing it on’ maybe with the increased exposure they will have another memorial show next year. Thanks again for taking the time.